One of the big advantages of digital marketing is that everything can be measured. And using that data, you can conduct highly targeted marketing based on location, demographics, even individual behaviour on a website. It’s tempting for online marketers to leave the uncertainty of the real world alone entirely. But no matter how digital we get, we are still made of flesh and blood, and do still live IRL. Any successful business needs some sort of contact with meatspace. Besides. There are ways of measuring bricks with bits. You just have to get a little creative. People have been attempting a ‘Google Analytics for the real world’ for a while now, with a certain amount of success. Traditional retail analytics largely produces junk data. Door clickers, heat mappers and customer counters (achieved with ceiling mounted lasers) might produce a spill of numbers, but its use is limited. For starters, it’s nearly impossible to weed out staff from customers. That alone makes the data nearly useless. Far more useful is Euclid Zero – product of Euclid, offshoot of Google acquisition Urchin; which became the basis for Google Analytics. Euclid Zero uses MAC addresses from smartphones to track individual customers around shops, restaurants or any physical space. MAC addresses are discovered when the device pings the shop wi-fi, and in no way allow you to identify individuals, but are unique to each device; and can therefore differentiate one customer from another (and staff). This allows you to accurately tracks both brute customer numbers and their individual journeys around the shop. The technology is highly impressive, but it still falls short of breaking down even simple demographics. Tremendous for privacy. Not so good for marketing. Where online marketing really shines, though, is in personalising marketing. Sending automated (or not) messages tailored to individuals, based on recent interactions, their position in the conversion funnel, and their demographic. With a little creativity, that can be achieved in the real world too. We’ve been working on precisely this for our client Thai Leisure Group. By analysing the normal customer experience in one of their restaurants, we’ve identified multiple points at which data can be collected – and permission granted for more granular information – which can then be collated and used for future marketing. We gather data from the restaurant wi-fi, point of sale, web booking and surveys. Using this data, we can then trigger automated messages to prompt restaurant visits, give special offers or just send standard newsletters. It also gives us a valuable data sample of actual restaurant visitors to use alongside online analytics and till receipts. The trick to getting deeper than counting customers with MAC addresses is incentivising customers to hand over their data. On the web, it’s easy – that cookie notice everyone ignores is all the permission you need to track users with Google Analytics. In real life, it takes a bit more. In the real world, nobody is going to hand over their personal information without a reason. So it’s important to offer something tangible in return: a special offer, access to exclusive contents and events, a running discount (5% off every meal in return for allowing us to track your interactions with us). The more you offer, you more you can ask in return. The more you ask in return, the more useful the data you collect – and the more personal you can make the marketing. Yes, it will cost money. But the return on investment will certainly be worth it. People don’t only live in their browsers. Real-world interactions will always be worth more than virtual. 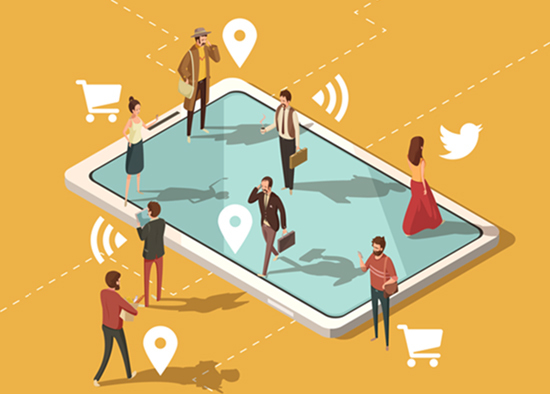 What we’re describing is “omnichannel marketing.” It’s one of those buzzwords thrown around with little thought – sometimes to describe something as small as using Facebook AND Twitter. Scrub the buzz away and what we’re talking about is spotting opportunities wherever you can find them, and using them to construct a seamless customer journey that spans multiple touch points. Or, in less jargonistic terms: to remove the barriers between the different ways a customer interacts with you. The line between digital and physical is increasingly blurred. Our smartphones keep us constantly tethered to the internet no matter where we are. That means that as businesses and marketers our customer interactions must similarly straddle the bits and bricks. The most effective marketing has no disjoint between binary and analogue. Constructing the infrastructure takes more creativity, resources and effort than installing Google Analytics, but it immediately puts you one step ahead. Want to make your digital marketing more analogue? Speak to us today.